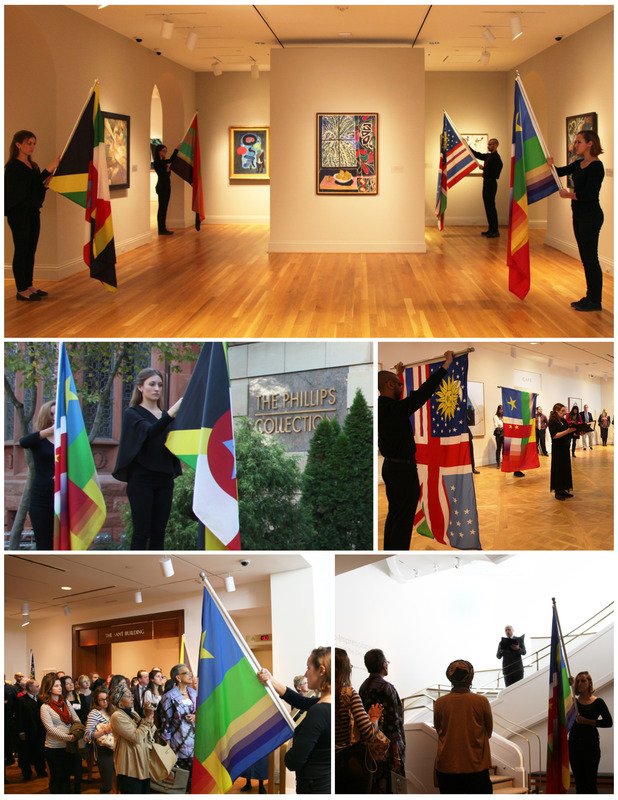 On October 27 artist Pedro Lasch premiered his work Abstract Nationalism/National Abstraction: Anthems for Four Voices at The Phillips Collection as part of the International Forum Weekend in Washington. In this audio-visual performance, national anthems of specific countries are sung in the language of the country listed alphabetically after it in the World Almanac. In a six part blog series, Curatorial Intern Lauren Reuter asks the artist about this work and how it fits into the Phillips, art, and politics. Read Part 1 here, Part 2 here, Part 3 here, Part 4, and Part 5 here. Exploring themes of nationality and diplomacy during the International Forum Weekend will undoubtedly engender discussions on art and politics. What do you see as the relationship between the two? Do you see a tension, a playfulness, both? To me, that’s very much tied in the title of the work. The title is a provocation. I’m bonding two words that we don’t like to see in relation to each other: abstraction and nationalism. As long as there has been art, there have been debates about whether it should be political or not. But whenever you speak of abstraction in art, there have been strong tendencies to assume that art must be separate from politics. A few years after the occupation of Iraq in 2003, they tried to institute a new flag to eliminate the handwriting that had been put on it during Saddam Hussein’s reign. There was a national competition, and a contemporary Iraqi artist won. The artist chose the colors blue, white, and green. It was a nice half moon, a beautiful design—a very abstract representation of the Kurdish, the Suni, the Shi’ite. People were outraged: “You’re crazy! Our colors are red, white, and black with the green star. Those are the Arab Union colors, you can’t mess with that. The only other country in the region with white and blue is Israel.” Politically and from a national standpoint, it was a fiasco, all because of the choice of color. But if you say, “Who’s afraid of red, yellow, and blue in a Barnett Newmann painting?” It’s just this big colorfield painting with three colors. It’s a flag! Visually speaking, the two are not that far from each other. We just like to pretend that they are. The language of high modernism is deeply indebted to national symbols and vice versa. It’s not by chance that Jasper John’s most famous artwork is the US flag. Some will say the two should never mix, and some will say the two are always mixed and its nonsense to say they aren’t. I enjoy the pluralism and the huge range of artistic practices. 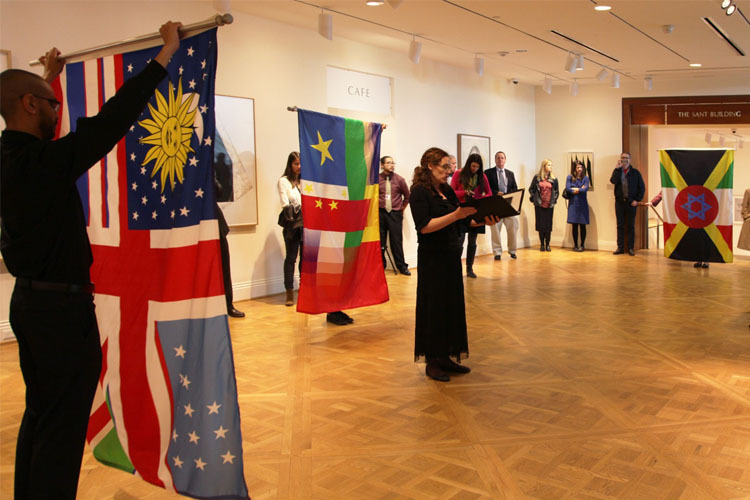 Today artist Pedro Lasch premiered his work Abstract Nationalism/National Abstraction: Anthems for Four Voices at The Phillips Collection as part of the International Forum Weekend in Washington. In this audio-visual performance, national anthems of specific countries are sung in the language of the country listed alphabetically after it in the World Almanac. In a six part blog series, Curatorial Intern Lauren Reuter asks the artist about this work and how it fits into the Phillips, art, and politics. Read Part 1 here, Part 2 here, Part 3 here, and Part 4 here. How do you envision the project’s relationship with this audience? What do you want your audience to come away with? I try to make work that is for a wide range of ages and backgrounds. The range is really important to me and the work is designed to do that. And that full range for me also includes the unsuspecting audience member who came either to the International Forum event or came to the Phillips that day and encounters the work; they stumble upon the work and don’t know what the background is. It may be someone who works at the embassies and came to the Phillips, or someone who may have absolutely no interest in national culture or nationalism. But with this project, the raw materials of national symbols and songs are materials that most of the people of the world, on this planet, have to care about. We don’t have a choice. Whether you like it or not, you had to at one point come to terms with being associated with your flag and anthem. When you encounter something that uses a flag, whether it’s a Jasper Johns artwork or an ad on TV, you have a connection with it. Hopefully that connection will let us bring in all kinds of audiences that don’t usually engage with social practice work or with the Phillips, necessarily. But it should also open up people who may be used to visiting the Phillips only to see modern art, or in the case of the International Forum, a conference. This may become the first social practice artwork they are a part of. That’s really the beauty of it, and that’s why I make the art. It’s not that I just enjoy the process, but that I don’t know the answers. To me, the response of a kid who speaks Spanish at home and can sing the US national anthem for the first time in this language is as important as a scholar of contemporary art practice who may hate anthems and flags and be very uncomfortable by the whole situation.